Is Cypress Semiconductor a Buy? This chipmaker's shares have taken a drastic haircut in 2018. Here's why, and what its investors should do next. Semiconductor makers have been in a difficult corner of the stock market in 2018, and that includes embedded chip specialist Cypress Semiconductor (NASDAQ:CY). Cypress' shares have taken a 17% haircut this year even though the company exceeded Wall Street's earnings and revenue targets in each of its last eight quarterly reports. Are the pessimistic market makers onto something, or would this be a good time to pick up Cypress stock at a discount? Since merging with memory-chip maker Spansion in 2015, Cypress has delivered sprightly growth on both the top and bottom lines. 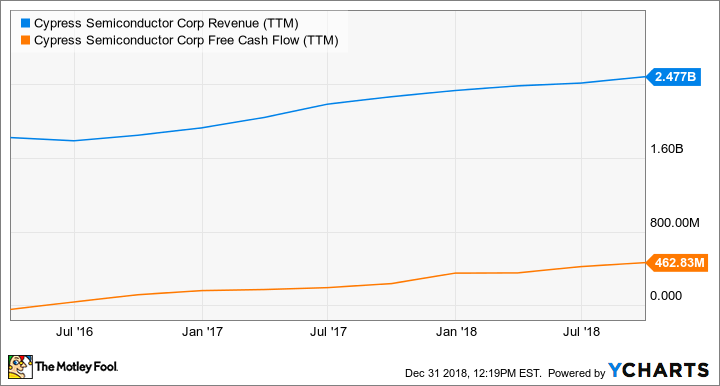 Starting from the first quarter of 2016, in an effort to avoid direct merger-based boosts, Cypress has seen its sales rise by 36% while free cash flows skyrocketed from basically breakeven to $462 million a year. Cypress delivers connectivity, storage, and microcontroller solutions to several vibrant end markets, including a respectable foothold in the automotive computing sector. In particular, management expects connectivity sales to grow by double-digit percentages for the next four years or so. We're talking low-power Wi-Fi and Bluetooth chips for the Internet of Things and automotive markets, alongside a market-leading position as a provider of USB-C controllers. So the company is working in several promising growth markets and has some strong financial performance to show for it. Value investors might catch a glimpse of Cypress' astronomical price-to-earnings ratio and back away slowly. The stock is trading at 97 times trailing non-GAAP earnings, which is a deal-breaker for many value chasers. At the same time, you can buy Cypress shares at bargain-bin valuation ratios such as 10.7 times EBITDA profits or 10 times free cash flows. These ratios have been plunging downward all year long as the stock stuttered while cash profits were on the rise. The key to this split-screen picture of Cypress lies in the company's actual chip manufacturing assets. Using a hybrid manufacturing strategy that reminds me of Texas Instruments, Cypress handles about 65% of its manufacturing needs by placing orders with third-party chip foundries but tackles the remaining 35% of its chipmaking business through a network of in-house manufacturing facilities. Chipmaking equipment is expensive stuff, which leads to some creative accounting tricks. The big up-front cash costs of manufacturing gear are written off against earnings over many years in the form of depreciation and amortization charges. Cypress reported $53.6 million of GAAP net income over the last four quarters but these bottom-line results included $281 million of depreciation and amortization charges. This technique allows Cypress to pay taxes based on lower GAAP profits while pocketing larger actual cash profits. Cypress is doing just fine as a business with healthy cash profits and an eye toward sustained long-term growth. Share prices are falling for all the wrong reasons, more closely connected to pessimism about the chip sector as a whole than to anything Cypress is doing. The international trade wars will have to end at some point and so will the flagging interest in the latest and greatest smartphones. Meanwhile, 5G wireless networking and self-driving cars will push this company's most important target markets for many years to come. You can pick up this stock at very reasonable prices -- except in terms of basic P/E ratios, as explained above -- and the falling share price has also driven Cypress' dividend yield all the way up to 3.5%. What's not to love?